Shopping in Turin is sure to satisfy nearly every taste. Whether you are looking for great food, designer clothing or antiques you will find it here. For serious shopping in Turin and great value visit the markets, I simply love them and nearly every neighborhood in Torino has its own local market. The most famous by far is the Porta Palazzo market in Piazza della Republica. This huge market is the biggest in Europe and sells nearly everything you can possibly imagine from fish to shoes and lots of other weird and wonderful stuff. I could spend the entire day here...and often do! Every second Sunday of the month the Gran Balon antiques market is held in the same area and this really has to be seen to be believed. Grand Balon is one of the biggest antiques markets in the entire world and some incredible bargains can be discovered but make sure you give yourself plenty of time as there is so much to see. Corso Racconigi: Particularly good here is the fresh produce section which is below street level and is home to some of the best cheese, meat and seafood in all of Turin. This is the market my hubby loves, he spends hours here choosing what he'd like me to cook for dinner! The morning market in Crocetta, just off Corso Duca degli Abruzzi, is another great favorite of mine. 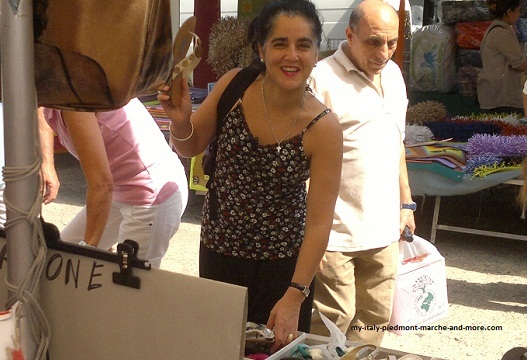 Crocetta is the best market for clothes, bags and shoes. Original and 100% authentic designer names are everywhere at a fraction of the price of the stores. Crocetta is a pretty upmarket area so they would never dare sell fakes! The neighborhood here is lovely, exploring this market or just sitting at one of the coffee bars having a morning espresso or cappuccino and croissant, while taking in the atmosphere is definitely one of life's little pleasures. If you are looking to do some serious clothes shopping in Turin then do make a point of visiting. The world's greatest gourmet paradise here in Turin! Eataly in Via Nizza 230 is the best food store you will ever visit and Eataly is indeed unlike any other food store you will ever visit. Inside this enormous shop/market you will find wall to wall gourmet delights and the best food that Piedmont has to offer from truffles to chocolates and much more in-between. Nearly everything sold here is produced by small artisans and is of the highest quality. The ten or so restaurants inside the store allow you to sample some of the best of Italian cuisine - from ice cream made the old fashioned way through to the most wonderful cheeses you will ever eat. Eataly is almost like doing a tour of the very best of Italian food but instead of having to travel thousands of miles to discover these wonderful “slow food” producers they are all here under one roof. It's worth making the trip to Italy just to visit Eataly! 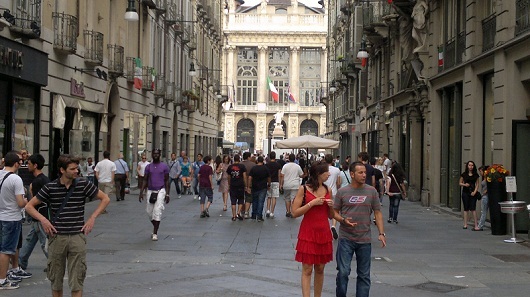 For the most fashionable shopping in Turin visit Via Roma, and the streets leading off it. This is where you will find all the leading designer stores and the prices to match - although you'll still find the same thing here way cheaper than in Milan. Best time to visit for shopping is in January or July when the big sales are held. Take in the atmosphere on a Saturday, when all of Turin seems to dress up in their finest to parade up and down this street and to be seen at the coffee bars of the adjoining Piazza San Carlo. Via Garibaldi is another shopping street that is well worth a visit, not as upmarket at Via Roma this pedestrianized street is packed with fascinating little shops and always has a wonderfully eclectic feel. There an outlet village, the Torino Outlet Village, located in Settimo Torinese. It's around 20 minutes drive from Turin and you'll find all the top designer brands at discounted prices. You can find out how to get there and the brands they feature on their website - here is the link. Italy does not really do shopping malls much but Turin has a few good ones. The most central of them is 8 Gallery at 230 Via Nizza and opposite Eataly. 8 Gallery is very different to most shopping malls in that it is located in the old Fiat car factory of Lingotto. Lingotto was the famous Fiat factory with the roof test track. When the factory closed it was turned into a shopping mall with around a hundred quality shops, many restaurants, cinemas and the NH Lingotto hotel. If you get tired of shopping and want to view the famous test track this can be done from the shopping centre or hotel. Actually my husband loves this track so much, he could even skip the shopping entirely... talk about crazy! For more on wonderful Turin visit my guide. Need a place to stay in Turin? Try the Grand Hotel Sitea. Subscribe to our Free Monthly Newsletter full of great insider tips. Perfect for those who love Italy.